Allwinner A20 (sun7i) SoC features a Dual-Core Cortex-A7 ARM CPU, and a Mali400 MP2 GPU from ARM. 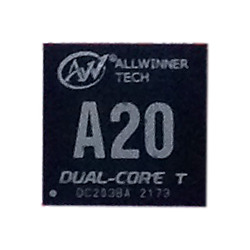 Allwinner A20 is a low-end (budget) version of the A31. It shares its Cortex-A7 ARM CPU architecture, but at the same time it is also pin-to-pin compatible with A10. A20 is fully supported by the community from linux-sunxi 3.4 kernel and later. A20 CPU consists of dual ARM Cortex-A7 cores, and integrates the Mali400 MP2 GPU. Together with Cedar Engine multimedia processing unit that is capable of up to 2160p ([email protected] 4k resolution or 1080p 3D decoding) video decoding, with integrated HDMI 1.4 output support, and H.264 HP (High Profile) in 1080p at 30fps video encoding. Cortex-A7 is 100% ISA compatible with the Cortex-A15, this includes the new virtualization instructions, integer divide support and 40-bit memory addressing. Any code running on an A15 can run on a Cortex A7, just slower. This is a very important feature as it enables SoC vendors to build chips with both Cortex A7 and Cortex A15 cores, switching between them depending on workload requirements. ARM calls this a big.LITTLE configuration. Cortex A7 and A15 includes hardware virtualization support. This page was last modified on 12 June 2018, at 21:52. This page has been accessed 285,150 times.